David Rodríguez Caballero: el pliegue según el pliegue is a thematic and retrospective exhibition of the creations of David Rodríguez Caballero (Dueñas, Palencia, 1970) that brings together a selection of the typologies and series of his work from 1999 to the present day, presented simultaneously in two spaces in the city: the Esteban Vicente Museum and the Cathedral of Segovia. 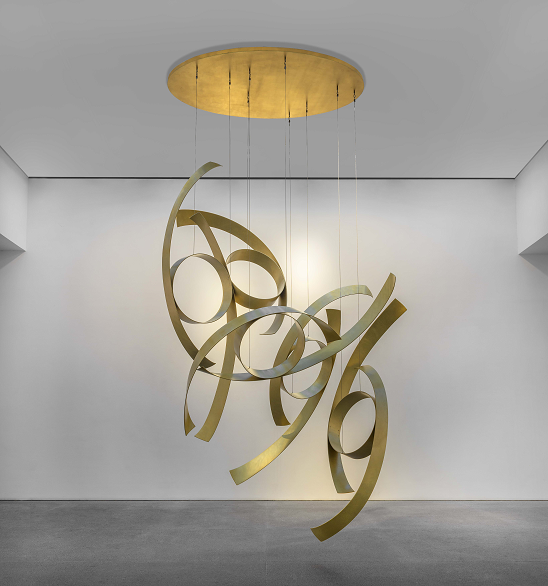 The show includes, in an approximately chronological fashion, all the typologies, series, media and techniques with which the artist has experimented and developed his work, both pictorial and sculptural – from the pictorial plane to the “displayed plane” – using as a main theme his continued use of the folding technique, applied to steel, aluminium and previously to paper. Paper folding has enjoyed, and still does, a certain handcrafted, artistic and didactic tradition, perhaps most obviously represented by the work of Johannes Itten or Josef Albers with the pupils of the Bauhaus school and the Japanese art of the Origami. 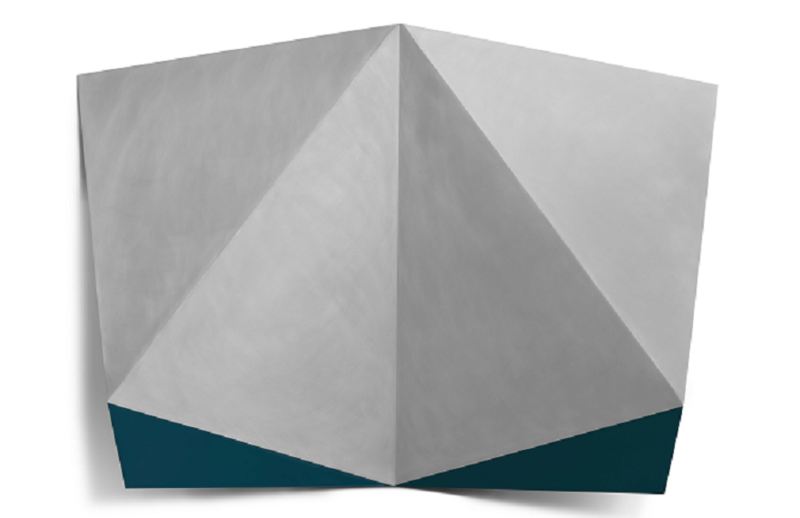 It was the latter that gave its name to the series of folds in tracing paper and vinyl, which was the beginning of the David Rodríguez Caballero’s road into folding, more specifically into geometrical folding. From the origamis a sequence of “paintings” would be born, constructed from discarded strips of vinyl glued to methacrylate and to plastic. The vinilos are flat pieces with barely a pictorial hint left in them, they are “constructed paintings” in the tradition of the “painting without painting”, using as a resource the cut vinyl strips, glued and cumulatively assembled until almost covering the support of each “painting”. In 2009, the artist began to use the curve, and above all, the angle, using metals, applied initially in a small scale to jewellery designs. 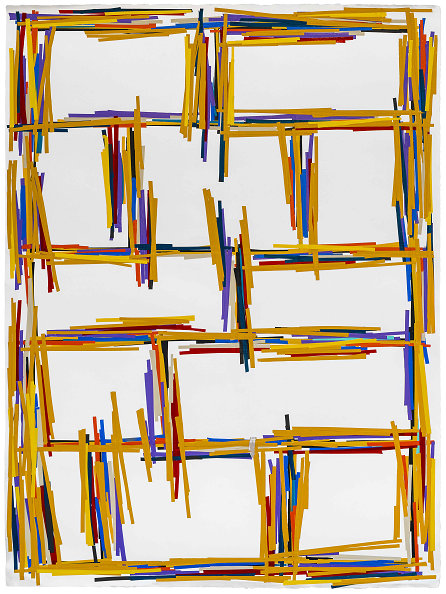 Up to then, his creations in metal had followed the parallel plane of the wall, with small geometrical square figures, painted with oils, first attached to the surface and finally leaving the border of the picture, like fragments escaping the reticules of a Mondrian. From that point onwards, his metals would lose their privileged parallel relationship with the vertical plane of the wall entering also, without turning back, the route of the fold that has dominated the work of David Rodríguez Caballero ever since, both in a small and large scale, interior sculptures, or monumental pieces for open spaces. 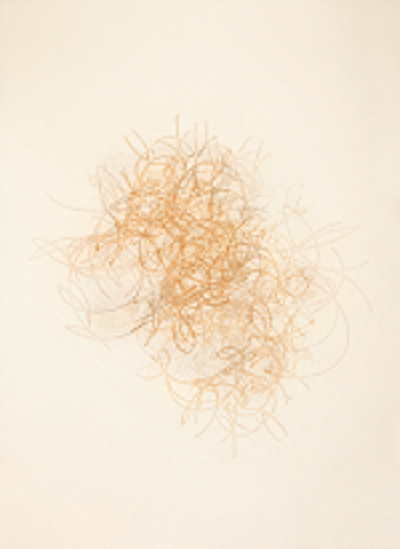 The exhibition also displays a large number of his drawings, those that are part of his working processes, as well as others that can be considered as substantial, in addition to five very recent etchings. The concept of the fold has always been present in the history of art, particularly since the studies of the Baroque by authors such as Wölfflin or d’Ors, or – in the wider of sphere of philosophy – Deleuze. It is not difficult to relate two such apparently disparate moments like the Baroque and contemporary culture because they both have in common precisely the continuous fold, tending towards infinity, between the real and the imaginary: if “the fold is the central action of the Baroque” (Gilles Deleuze), a kind of digital fold, omnipresent and mediatic, is the central action of the contemporary culture that is produced, in an eminently Baroque fashion, in form, gestures and contents. The Baroque, however, was a predominantly religious culture; ours is secular and profane. 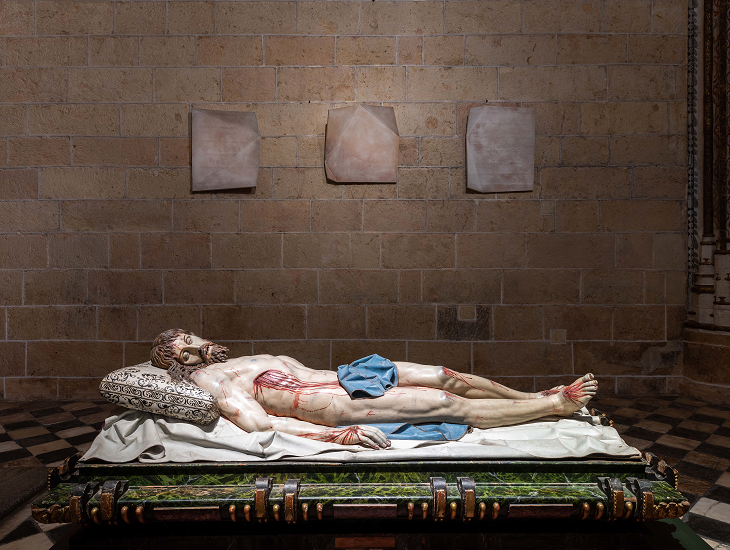 In the fold of this difference, the artist has made an intervention in the cathedral of Segovia (the most important sacred space in the city), alongside the exhibition in the Esteban Vicente Museum (the most important secular space in the city). The sculptures conceived by the artist for the cathedral are placed around the Baroque carving of the Cristo Yacente (Lying Christ) by Gregorio Fernández (17th century) located within the Lying Christ Chapel. Rodríguez Caballero created four pieces dedicated to the “cardinal virtues”, suggested by abstract pieces, and the figure of the dead Christ, working precisely on the fold of a difference, which also alludes to the difference found in our cities between the sacred spaces of the symbols, rites and religious cult (churches) and secular culture (museums). The exhibition David Rodríguez Caballero: el pliegue según el pliegue aims to place the work of its protagonist precisely in “the fold in the fold” (Pierre Boulez), which exists between a particular artistic practice such as his and the primordial character of the fold in our culture, to represent the former as one of the most interesting and effectively beautiful artistic strategies of our Baroque culture. David Rodríguez Caballero conversa con Carmen Huerta, autora del vídeo e impulsora del proyecto THEARTCHAT, un proyecto que pretende responder a una de las necesidades culturales más esenciales en el siglo XXI en el ámbito del arte contemporáneo: la información a través de la creación de contenido audiovisual. THEARTCHAT es espacio de conversación en el estudio/espacio de trabajo de los artistas que pretende dar voz al proceso creativo, a veces olvidado pero siempre esencial para el artista y para los estudiosos del arte. Esta conversación dentro de un marco de libre expresión para cada artista busca por un lado dar voz a este proceso de creación, y a su vez generar una plataforma de contenido audiovisual que ayude a entender las bases de la nueva creación de artistas vivos, acercando así su obra a los coleccionistas, aficionados y curiosos del arte contemporáneo.